Explanation: This cylindrical projection global map is one of six new colour maps of Saturn's midsized icy moons, constructed using 10 years of image data from the Cassini spacecraft. 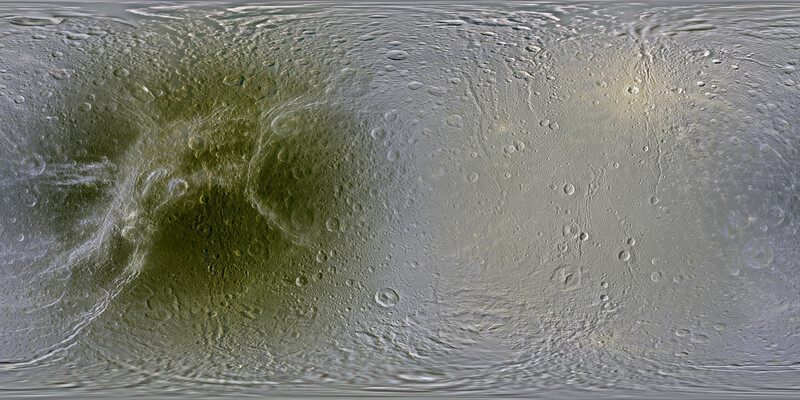 Discovered by Cassini (the astronomer) in 1684, Dione is about 1,120 kilometres across. Based on data extending from infrared to ultraviolet, the full resolution of this latest space-age map is 250 metres per pixel. The remarkable brightness difference between the tidally locked moon's lighter leading hemisphere (right) and darker trailing hemisphere clearly stands out. Like other Saturn moons orbiting within the broad E-ring, Dione's leading hemisphere is kept shiny as it picks up a coating of the faint ring's icy material. The E-ring material is constantly replenished by geysers on moon Enceladus' south pole. Lighter, younger surface fractures also appear to cross the dark, cratered trailing hemisphere.